If you’re sweating excessively you could be suffering from a medical condition hyperhidrosis. Fortunately, it’s something the doctors at Body Renewal could help treat with a quick and non-invasive procedure requiring zero down time. Everybody sweats. It’s one of many ways our body attempts to regulate our temperature and, because our emotions have an effect on our sweat glands, we sweat when we’re nervous or excited too. When we’re young not all of our sweat glands are functioning, but we have a three million of them and by the time we hit our teens they’ve all been turned on. People consider sweat ‘smelly’ but they’re only half right. Sweat, on its own, doesn’t really have a scent but when it mixes with the bacteria on our skin it develops a distinctive odour. 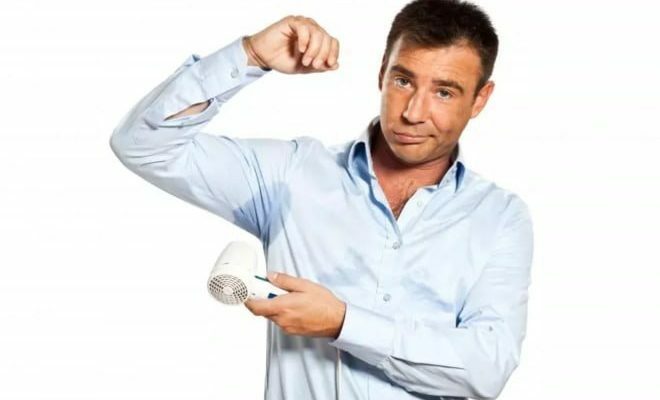 Still, if you’re only sweating as opposed to suffering from hyperhidrosis, all you need is good antiperspirant, one that’s mixed with anti-microbial agents. Many think that the words antiperspirant and deodorant are interchangeable but there is a difference. An antiperspirant contains active ingredients that form an occlusive gel that literally blocks your sweat glands, reducing the amount you perspire. A deodorant, however, merely masks the smell with fragrance and doesn’t reduce how much you sweat. The amount of sweat you produce is dictated by your hormones so some people just sweat more than others. If, however, you suffer from hyperhidrosis, your sweating is so excessive it’s uncontrollable. Any part of your body that has sweat glands can be affected but the most commonly are the underarms, hands and feet. There are two types of hyperhidrosis – ‘primary’ is characterized by sweating excessively for no underlying reason and ‘secondary’ is when the sweating is caused by something else. In the case of primary, your sweat glands become hyperactive, often starting in childhood or puberty and doctors aren’t sure as to why. Oddly, it usually won’t happen when you’re asleep. If your hyperhidrosis is secondary, as in caused by something else, reasons could range from being a side-effect to a medication or a symptom of a disease like diabetes. It can occur when you’re awake or asleep, usually affects your entire body but can also be ‘focal’, meaning it just affects a particular body part. As with any medical condition, it’s important to get to the root of the matter which is why your first step, if you’re to treat hyperhidrosis, is to find out what’s causing it. Once your doctor has established what type you have, they’ll suggest a treatment option. If it’s just a passing condition, they’re not likely to suggest an invasive permanent resolve like surgery when you could benefit from a clinical strength prescription antiperspirant. At Health Renewal our doctors can best advise you on a course of action as well as administer Botulinum toxin like Botox or Dysport. Many are often surprised to learn that injectables like these can be incredibly effective in treating hyperhidrosis as they can block the neurotransmitter that activates sweat glands. It’s not a permanent fix, but it can last for up to four or five months and you can repeat the injections as many times as you want. In short, with the right diagnosis and treatment, hyperhidrosis can be controlled, if not completely cleared up. So don’t sweat it! To find out more visit www.bodyrenewal.co.za.